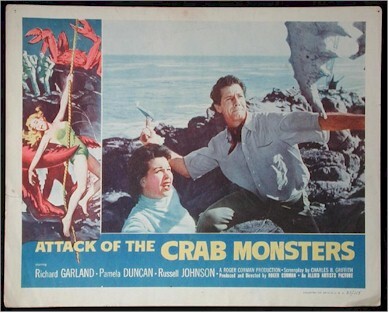 Rare lobby cards from this highly collectible 1957 sci-fi classic.Both in excellent condition. Excellent graphics and border art! First card is the best in set as the only one to show any scene with the crab, $175. The second card of the cast looking at the crab (but not shown) is $125. Or both for $275. One sheets sell for up to $2000! !